The White Bear theatre was founded in 1988 under Artistic Director Michael Kingsbury, with a focus on the presentation of new writing and lost classics. Creatives to have worked with the intimate 50-seat space include Tamzin Outhwaite, Emily Watson, Lucinda Coxon, and Joe Penhall. The theatre has had many productions transfer, including Personal Enemy, The Duchess of Malfi, Madness in Valencia, and Round the Horne… Revisited. It has received numerous accolades such as the Peter Brook Empty Space Award, the Time Out Best Fringe Venue, and the Mark Marvin/Peter Brook Award among numerous others, and still maintains a reputation as one of London’s most interesting and exciting fringe theatre venues. 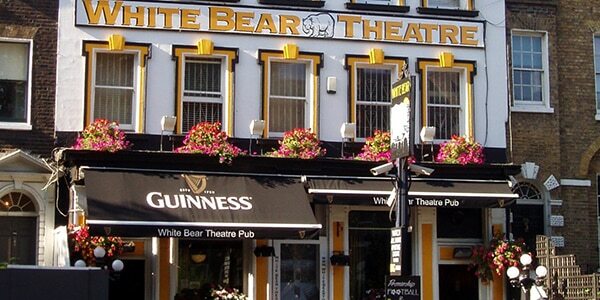 The White Bear is available to hire and welcomes the submission of unsolicited scripts and proposals to revive lost classics.